As far as Texas traditions go, road-tripping is up there with rodeos and Friday night lights. Texans are stubborn when it comes to road trips, and we pretty much refuse to fly anywhere within the borders of our massive state. Common road trips are from Austin to San Antonio, Houston to Dallas, and pretty much anywhere to South Padre Island. But with so many fantastic big cities and fascinating destinations, the small towns can get overlooked. The small towns of Texas should not be ignored. The small towns are where some of the most interesting Texas history took place. And even today, you can have some great adventures traveling the small towns of Texas. With that in mind, we've created the ultimate small town Texas road trip. Starting in Marfa, you'll hit I-10 and head east, with very few detours. Outside Houston start heading North on 146 and take it until it turns into 59. Drive through the picturesque Angelina National Forest up to Jefferson. Then head back West on I-20 until just outside of Tyler. From there you'll drive Southeast to West, Texas, and eventually pick up on 183 to Seymour. The last leg is on US 70 and up I-27 into Canyon. This list represents just 22 of the small towns you'll pass through if you travel this route. There are even more adventures in between! We begin our road trip in the tiny town of Marfa. A lot has been written about the West Texas art community that is Marfa. Stay at El Cosmico, visit the Museum of Electric Wonders and Late Night Grilled Cheese Parlor. Try to see the "Marfa Lights," and enjoy this unique oasis in the middle of the desert. Just down the road from Marfa you'll pass through Alpine. Alpine is perhaps most well known for being the home of Sul Ross State University. But it's also a slice of old West Texas. Visit the Museum of the Big Bend, and check out the intricate murals that adorn the exterior walls of the town buildings. While stopping in Fort Stockton be sure to check out the enormous road runner statue. The Annie Riggs Memorial Museum is also a great place to check out. This historic Texas town has plenty of interesting things to see. "The biggest little town in the world" is the motto of Ozona, Texas. While traveling through Ozona take a look at the Davy Crockett statue. The Crockett County Museum is across the street from the statue, and contains a lot of interesting West Texas history. As you leave the Big Bend region and near the Texas Hill Country, you'll come to Junction. In Junction, you can go fishing on the South Llano River, and do some bird watching in the South Llano River state park. 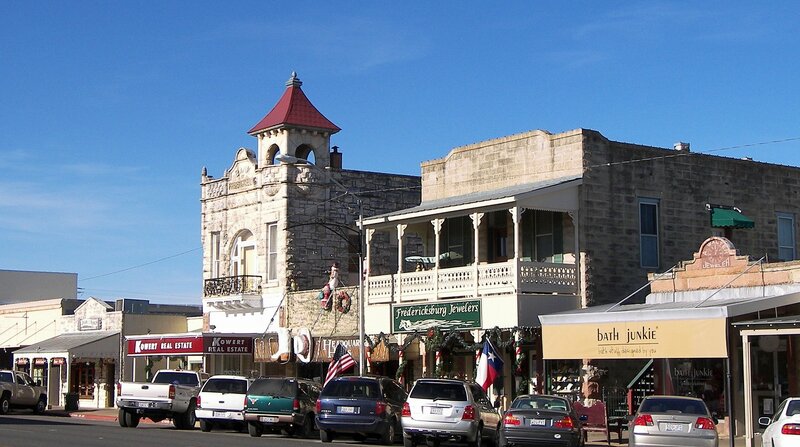 One of the premier destinations in the Texas Hill Country is Fredericksburg. Fredericksburg steeped in Texas history, and has ample shopping and entertainment. If the peaches are ripe, you can't miss out on some Fredericksburg peaches. If not, check out one of the many wineries on Main Street. No small town Texas road trip would be complete without swinging by Luckenbach. Step into the dance hall for a beer and check out the general store. Be sure to get a few pictures of Texas's smallest town. With a population of three, they're not joking when they say everybody's somebody in Luckenbach. Just down the road from Luckenbach is the quaint little town of Blanco. Blanco is home to the Real Ale brewing company so stop in the tap room for a good brew. The Blanco River also runs through the town, and (depending on the season) you could stop into the Hill Country Lavender Farm. Gruene is a must-see for anyone traveling through the Texas Hill Country. This small town is nestled within the larger city of New Braunfels. But Gruene has a history all its own. Visit the many shops and restaurants that line the shady streets, and take in some live music at the historic Gruene Hall. Gonzales is truly one of Texas's most historically significant towns. If you're familiar with the phrase "Come and Take it," that phrase (in Texas history at least) originated in Gonzales. Check out the Gonzales Memorial Museum to learn more about that. And don't miss the Old Jail Museum. If y'all thought Shiner is just the name of the beer, you've got another think coming. This tiny Texas town is home to the Spoetzl Brewing Company, who makes Shiner beer. Shiner is one of Texas's favorite brews, and the town is something else as well. The brewery is open for tours, and you can also take in a show at the historic Gaslight Theatre. Be sure to stop by Howard's on your way out of town. Another great place to learn about Texas history is Goliad. The Goliad Massacre took place in this tiny Texas town in 1836. It's also the home to the Spanish mission Presidio La Bahia, which you can actually stay in overnight if you reserve it in advance. Liberty, Texas is just past the hectic Houston traffic on the Northeast end of town. Take in a show at the Liberty Opry and the full-sized replica of the Governor's mansion. Though 24,000 residents may seem like a pretty large small town, Marshall is still a must on this trip. Marshall is called the "cultural capital" of Texas. The town is rife with history from the Civil War era as well as the Texas Revolution. Also, you'll be traveling through it twice on this road trip, so you might as well check it out. It might seem odd to trek out to Jefferson, given that you'll have to backtrack a bit, but trust us, it's worth it. Jefferson is a vibrant little town where you can find all kinds of fun and interesting activities. Since Jefferson is reputed to be one of the most haunted towns in the state, you can take a ghost tour, or check out any one of the over 70 historic landmarks in town. Why not stop at the East Texas Arboretum and Botanical Society in Athens? You could also do some fishing at the Texas Freshwater Fisheries Center. You could also try to catch the annual Warriors Auto Show if you're a car lover. It may be a small town, but there's plenty to do in Athens. If you're traveling through Texas trying to hit as many small towns as possible, you've gotta stop in West. West is known for their kolaches, but there's more to this tiny town than delicious baked goods. Since West is the "Czech point of Central Texas" you'll want to check out the cultural festival of Westfest if possible. Westfest is held annually every Labor Day weekend. Though Dublin Dr Pepper may be a thing of the past, that's no reason to skip out on Dublin. You can't miss the Dublin bottling works where delicious cane-sugar sodas are made. But there is also plenty of historical places to visit. Try out the Rodeo Heritage Museum, or the Dublin Historical museum. Cisco has an interesting history in Texas. Cisco was the location of the very first hotel ever owned by Conrad Hilton. Also, in 1927 it was the site of a bizarre crime known as the Great Santa Claus Bank Robbery. While passing through Cisco check out the shops and restaurants, and if you're there at the right time of year you might even be able to catch Rock the Ranch, a faith-based concert series. On the last leg of your small town Texas tour you should stop in Seymour. The little town in Baylor County is a hotbed of paleontological finds. There's even an ancient critter named for the town. Seymouria was a small Permian-era reptile that is a link between dimetrodons and dinosaurs. You can learn more about that at the Whiteside Museum of Natural History. If you've never been, then you've just got to stop in Happy, Texas. "The town without a frown" as it's called is one of Texas's most famous tiny towns. If nothing else, you need a selfie in front of the city limit sign. If you make it this far, congratulations! Your prize is Canyon, Texas and the gorgeous Palo Duro Canyon for which it is named. Hike out to the Lighthouse (a rock outcropping in the canyon) or take a bike ride through the quiet bliss of the canyon's natural beauty. You could also visit the Panhandle-Plains Historical museum if you get too hot out wandering the canyon. You can actually stay in cabins on the rim of the canyon as well, if you book them far enough in advance!